Raising a Super Dog - moved to rasuperdog.com: Wordless Wednesday: What day is it? Micron pauses to ponder the mysteries of the natural laws. Like gravity, fer instance. The mighty Micron wishes you a Happy Wordless Wednesday here in the great dog blogosphere. Or perhaps for the likes of us as we prepare ourselves for another workday on the cube farm, we would send out Happy Hump Day greetings. My cube partner to the due south of my office is Mike. Micron's nickname is Mike. Micron goes to the office with me every day where we share our general space near cubemate Mike. I talk to Micron throughout the day, sometimes with cutey dog talk. Other times to correct a certain behavior. The dog spies an anomaly outside the office window that is determined by the ever alert canine noggin as something needing immediate attention. A robust gerWOOF by Micron rings out the alarm. Meanwhile cubemate Mike is talking with someone at his desk. Mike!, I say like I really mean it. Quiet! bwahahahaha. This never gets old. It just doesn't. So a Happy Hump Day to y'all today. Mike Mike Mike Mike Mike, what day is it, Mike? Wuuhahaha. That GEICO commercial is seriously one of my most favourites these days. It never ceases to make me snort! Thanks for the reminder on this early Hump Day! I think I've worked with an incarnation of that camel somewhere along my career. He reminds me of the kind of guy that greets you every day in the third person with a "And how's Donna this morning?". How does one answer that anyway? "I don't know. I'll have to ask her and get back to you on that." Still working on my snappy comeback. You goldens and your tennis balls. Micron is a (we pause here while I look up the spelling) connoisseur of sorts. I believe we have somewhere around a dozen tennis balls in the play yard at the office in various states of disrepair. But there's a special one. Micron will reject all until he finds it and then it's Game On. Happy WW to you, our sweet friend. BOL! 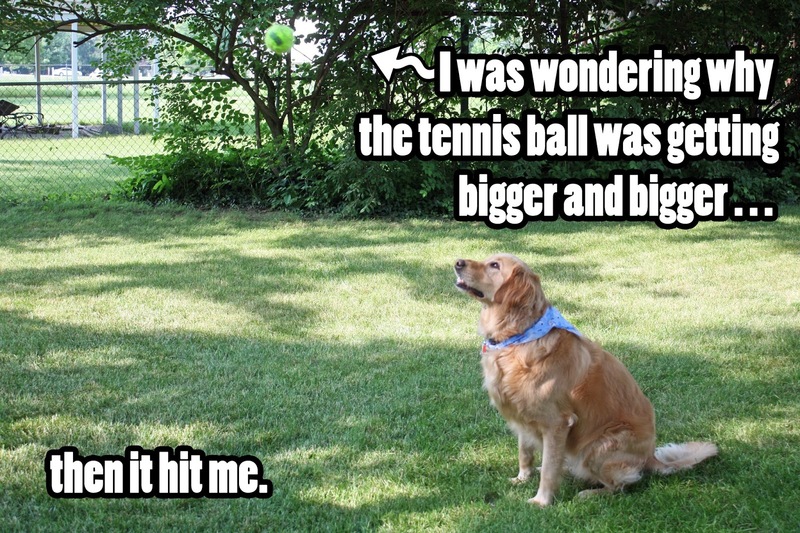 I love the tennis ball photo and saying. Doh! And that commercial always makes us BOL! Thanks Oz! A happy Hump Day and WW to you, our friend. So glad you stopped by. Great commercial and happy hump day to you! Yep, there's something familiar about that dromedary. Trying to remember who he reminds me of . . . I think it's a guy named Rich from earlier in my career. He falls into the same Annoying Co-worker category as that chick from Office Space and her "case of the Mondays." Happy Hump Day to you, Sue! Hope you have a happy hump day too! Hi CB and Kona, I took a peek at your blog at http://cbandkona.wordpress.com/ and you two are a pair of little fireballs, aren't you? Keep it going, my little friends. Happy WW and Hump Day to y'all.